Indian entrepreneurs, who have tasted success in their journey, have now started giving it back to the ecosystem which prompted their assent. And leading the way are Flipkart founders Sachin Bansal and Binny Bansal. After growing Flipkart from a humble online book store to a $10 billion mammoth ecommerce portal, they are now funding and mentoring other technological startups. Sachin and Binny Bansal have invested $1 million in this startup, which aims to design high speed electric two-wheelers. Along with Bansals, Raju Venkatraman, CEO of Medall Healthcare have also invested in this startup. Ather wants to bring the best Electric Scooter India has see. Some of the features of this vehicle are really quite good! In June this year, Sachin and Binny Bansal participated in an investment round worth $700,000, along with SAIF Partners and 13 other investors which includes Deep Kalra, founder of MakeMyTrip, Amit Ranjan, co-founder of SlideShare and more. TouchTalent provides a platform for creative artists and content creators to showcase their talent and sell their works. Thanks to the new round of investments, TouchTalent have been growing at a healthy rate of 30% per year and have 500,000 visits every year. 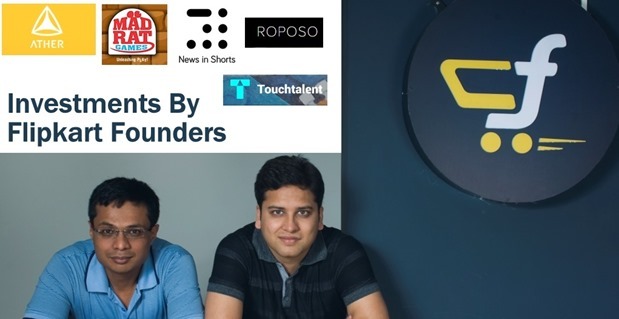 Binny Bansal and Seed Fund India Quotient invested $1 million in Roposo, which is a fashion focused social network, powered by a recommendation engine for gifts and accessories. As of now, Roposo has over 2 lakh products, across 5000 brands from 150 vendors. Along with Times Internet, Sachin and Binny Bansal invested in this mobile app startup, which provides summary of news items in 60 words or less. This startup was part of Times Internet’s accelerator T Labs, and their founders: Iqubal and Pandey have dropped out of IIT Delhi and IIT Kharagpur respectively, to launch this startup. The exact amount of investment was no disclosed. Along with IT outsourcing firm GlobalLogic, Sachin and Binny Bansal invested $1 million in this offline games startup. This company was founded by IIT graduates, and have launched 70 board games, puzzles and toys. The interesting fact is that, this company doesn’t offer any online games, but only sells games via offline medium. They had a turnover of Rs 3 crore last fiscal. This is their most recent investment – however, the investment is not done by both the founder. Sachin Bansal has invested in Spoonjoy along with Mekin Maheshwari, their Chief People Officer. The quatum of investment has not been disclosed. This funding round also saw a participation from Abhishek Goyal, founder of Tracxn and Sahil Barua, co-founder of e-commerce enablement services company Delhivery. Spoonjoy is Bengaluru-based startup which allows customers to order healthy meal packs. Customers can avail weekly subscription service that provides healthy meals at their doorstep. Spoonjoy.com gets around 300-400 orders on daily basis and majority of orders are from Offices. Snapdeal founders Kunal Bahl and Rohit Bansal have invested in startups such as Ola Cabs, Zumbi and Uni Commerce. InMobi cofounder Navin Tiwari has invested in LetsVenture, Tushky among others. Along with the money, such experienced and successful entrepreneurs bring tons of experience and insights for the new, upcoming startups. This is certainly a positive trend, and we hope that it continues. This new trend is surely a great sign for Indian startup ecosystem!